Based on the world famous "Nelson Bait" with a few extras. 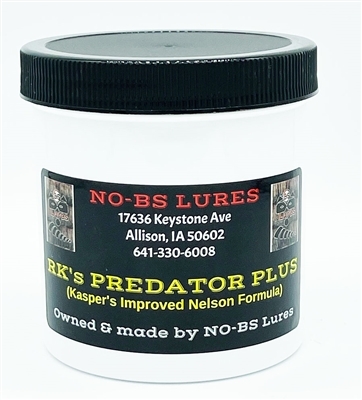 This bait is made from aged bobcat meat, has plenty of mink musk, rat musk & beaver castor, plus a few extras that make it even better than the original. Highest quality full strength ingredients are used in this bait. Used by one of the best in the business, professional trapper Bob Wendt, described by Craig O"Gorman as the BEST coyote trapper east of the Mississippi. This is a great bait for coyotes and bobcats. I use it with Murray's Fox Call 200 and red fox or bobcat urine in a typical dirt hole set.